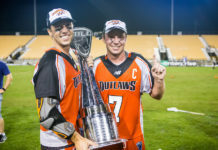 In typical, nail-biting fashion, the Denver Outlaws defeated the Chesapeake Bayhawks 13-12 in the semifinals to advance to the 2018 MLL Championship game, where they will meet the Dallas Rattlers at MUSC Health Stadium in Charleston, S.C. on Saturday, Aug. 18. With the victory, the Outlaws have qualified for the MLL Championship game for past three consecutive years. After breaking into the league in 2006, they have made for the postseason 12 times in their 13 seasons. As he has done all year long, Denver veteran attackman Eric Law recorded six points (2 goals, 4 assists) in the victory. Along with Law, attackman Kylor Bellistri and midfielder Zach Currier each tallied five points of their own to help lift the Outlaws past the Bayhawks. 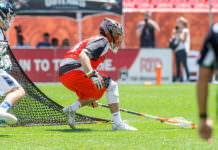 Outlaws faceoff specialist Max Adler won 21-of-29 (72.4 percent) and led the team with nine ground balls in his first postseason appearance of his career. This game was full of back-and-forth action; the first quarter saw Denver and Chesapeake each exchange two goals per team to head into the second quarter tied at two goals apiece. To kick off the second quarter, Outlaws midfielder Mikie Schlosser tallied a goal only 57 seconds in to help Denver take the early lead. Following that, Currier tallied a goal of his own to help increase the lead over the Bayhawks. Despite the Outlaws two-goal scoring run to begin the second quarter, Chesapeake tallied a three-goal scoring run of their own to regain the lead. 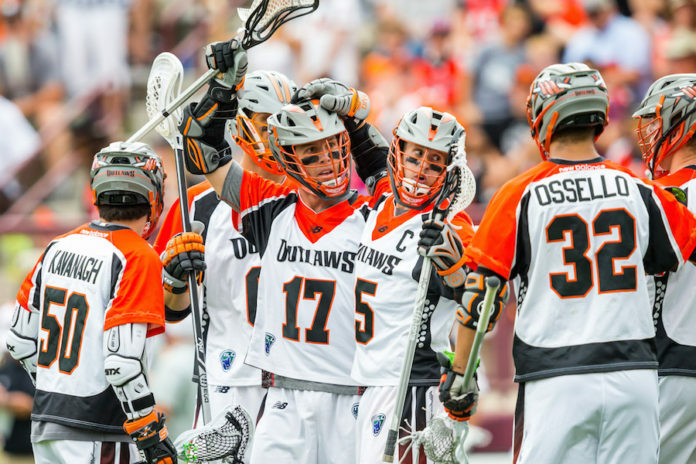 Late in the second quarter, Denver’s special teams took advantage of some undisciplined play from the Bayhawks, as Law tallied his first goal of the game. Shortly after, Currier notched his second goal of the game to give the Outlaws a 6-5 lead heading into halftime over the Bayhawks. The Outlaws continued to carry momentum into the third quarter with a two-goal scoring run to increase their lead over the Bayhawks to 8-5. However, the Bayhawks quickly responded with a three-goal run of their own to tie the contest. Denver’s Bellistri tallied his second goal of the game to give the Outlaws the 9-8 lead heading into the fourth quarter. Trading goals in the fourth quarter, the Bayhawks came up with a timely goal to tie the game at 12-12 at the 6:13 mark. With time winding down, Outlaws veteran attackman Matt Kavanagh recorded the game-winning goal to give the Outlaws the 13-12 victory over the Bayhawks, and advance to the 2018 MLL Championship Game. Denver now faces Dallas next Saturday, Aug. 18 in the MLL Championship.